Kathy: "It's nine degrees outside. Are you going to be okay?" Me: "Of course I will." What I'm thinking: "Nine degrees!!! That's frickin' cold. Do I really want to do this?" Running to work is not new to me, but I wasn't about to let something minor like a single-digit temp stop me from my quest to become more beastly. I put on my REI long underwear. I didn't regret my decision but I felt a little discomfort as soon as I hit the road. 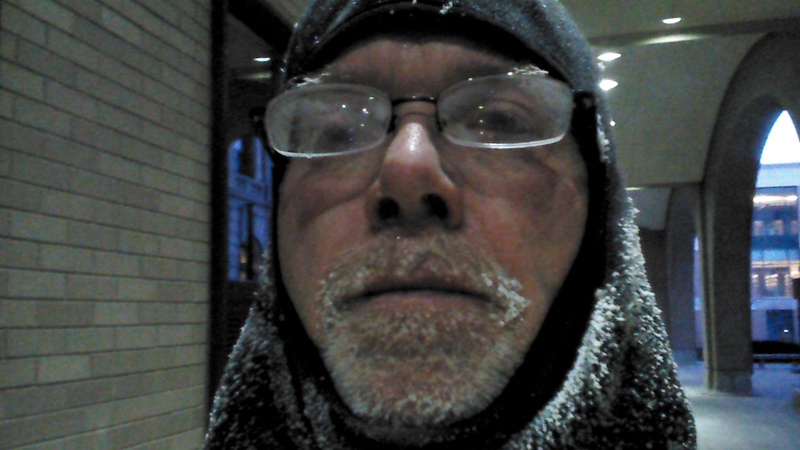 The air was absolutely frigid, my breath kept freezing on my glasses, and overall it was just a rough start. But that's to be expected. It usually takes me a couple miles to get warmed up, get my breathing and heart rate evened out, and hit my comfortable pace so I hung in there knowing it would get better. Besides, I'm always close enough to a bus route so I can bail out any time along the way if I need to. I was feeling much better by the time I got to Country Homes Blvd and it was pretty easy going after crossing Francis. I spent a lot of time in the roadways since they were much clearer than many of the sidewalks. I made sure I was visible, wearing a hi-viz yellow reflective jacket, a couple of red lights hanging off my backside and carrying my MiNewt 300 (battery velcroed to my backpack strap) to light my way. All the cars that needed to gave me plenty of room, which was very nice. I arrived at work without incident and in a reasonable amount of time. No frozen toes in the Vibrams, but a chilled thumb and index finger on my right hand. 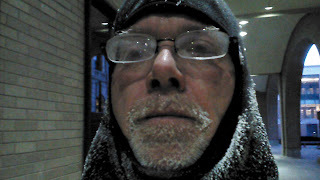 I'm used to ice buildup on my facial hair, but this time I had ice on my eyebrows and even on my eye lashes. That's a new experience for me. Every time I blinked I could feel them stick to my bottom lashes. Fun times. I sent this picture to Kathy to let her know I arrived safely.